The current result also reflected an increase from the $92.9 million reported for the first quarter of 2017, attributed to strong top-line revenues and stable credit, bank executives said. Net interest income for the quarter ended June 30, 2017 was $374.5 million, compared to $362.1 million for the previous quarter and $360.5 for the quarter ended June 30, 2016. The impact of having one more day in the recent quarter had a positive effect in the net interest income of $2.6 million, the report noted. Net interest margin was 4.02 percent for the quarter compared to 4.08 percent for the previous quarter. Operating expenses amounted to $306.8 million for the second quarter of 2017, a decrease of $4.5 million when compared to the first quarter of 2017, and a drop compared to the $309.1 million reported for the second quarter in 2016. During a call with analysts, former Popular Inc. CEO Richard Carrión officially “passed the baton” to his successor, Ignacio Álvarez, who assumed the position earlier this year. Carrión is now executive chairman of the financial institution. “As executive chairman, I will continue working with Ignacio in areas such as innovation and technology, social responsibility, government and client relations, and other strategic growth initiatives,” Carrión said. “I’m proud to see how everyone is handling this transition. Ignacio has assumed his new role with enthusiasm and confidence, and the management team is united and energized,” he added. The bank’s net interest margin of 4.02 percent decreased from last quarter’s 4.08 percent, mostly due to lower yields on additional liquidity from the Puerto Rico government deposit group. 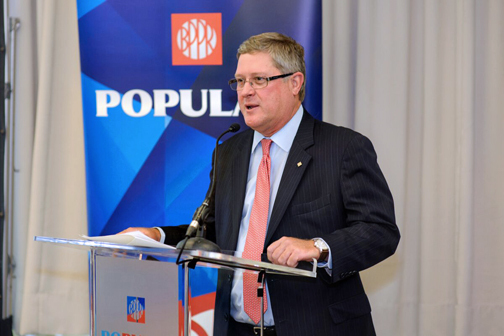 Popular Inc.’s spreads “remained strong,” relative to its peers, with its Puerto Rico net interest margin of 4.36 percent, Álvarez told analysts. “I am fortunate to step into my new role as CEO at a time when Popular is on a solid footing, as evidenced by our results for the second quarter,” he said. “Top line revenues were strong, credit quality remained stable and we achieved loan growth in both the United States and Puerto Rico,” Álvarez said. “We have set the focus on maximizing the unique retail franchise we have in Puerto Rico and continue enhancing our U.S. business. We also have an opportunity to tap our existing infrastructure on the island to obtain efficiencies and generate additional sources of revenue,” he said. As of the end of the quarter, Popular’s direct outstanding exposure to the Puerto Rico government is $517 million, flat from the previous quarter. “During the quarter, we took an impairment charge of $8 million on our remaining Puerto Rico central government exposure to COFINA bonds,” he said, referring to the Sales Tax Financing Corporation. “During the quarter, we sold the position and currently have no exposure to the central government or public corporations,” he said, adding Popular’s remaining exposure is related to municipalities, which are being monitored. Finally, Álvarez expressed optimism about the process currently underway to restructure Puerto Rico’s debt. “However, given current imbalances, the budget includes the reduction of government spending, which in the short run will negatively impact economic activity on the island,” Álvarez said. Hey Buddy!, I found this information for you: "Popular reports .2M in 2Q17 income". Here is the website link: https://newsismybusiness.com/popular-reports-2q17-income/. Thank you.